Are you taking the time to integrate math pre-tests into your math unit routines? I believe pre-testing is an important tool for planning differentiation in math. Today I'm sharing some benefits of different methods for pre-assessing our students in math. Pros and cons exist for each math pre-test approach that I’ve experienced, but I’ve found the pretest approach that I personally love and think is the best. If you are looking for ideas for pre-assessing your students or simply considering if there is a better way for you to implement math pre-assessments in your classroom, my blog series on pre-assessment in math should help you make some decisions! Now, while I'm encouraging you to implement pre-assessments into your math plans, I have to admit that it took me a while to perfect my pre-assessment routine. Believe me, I've done plenty of things not-quite-so-right when it comes to pre-assessing (and assessing) my students in math. In the past, math tests have sometimes occurred as an afterthought and I have fallen into the trap of giving students a math test because I needed grades or evidence for report cards. #I'mnotsayingIamperfect but I'm here to help! I've administered pre-assessments in math a few different ways, and I've had some time to think about "best practices" for pre-assessing students. As you read my analysis of each of the four ways I've assessed students, you'll be able to see how my beliefs about the purpose of pre-assessments evolved. Note: Read carefully because I am NOT endorsing all of these options as "the best" ways to assess. 1. Pre-assess and post-assess students with the same unit test for the unit's content. When grade level teams are moving towards "common formative assessments," this is often how it's done. The team or district creates a end of unit math test for the unit and teachers give it at the beginning of the unit to get a measure of "pre-learning" data. You only have to create or find one version of the math test. You have lots of information on what students know and don't know as you prepare to teach a new unit. 1. > > > Because you have "lots of information on what students know and don't know as you prepare to teach the unit," you may be overwhelmed by the information you have collected. By pre-assessing students on-grade level topics that they have not yet been taught, you will most likely find that students have deficits on MOST of the content. With a math pre-assessment that is really meant to be used as a unit test at the end of a unit, it is hard to know where to begin (wasn't figuring out how to proceed part of the goal of the pre-assessment?) and it can be difficult to sort out students who will really struggle with the content versus students who just have not yet been exposed. 2. > > > A detailed math pre-assessment that is as long as your post-assessment may take a huge chunk of class time. If you plan to pre-assess your students this way for each math unit, the class time lost may negatively add up and in the end, you may be led to believe that pre-assessing is a waste of your time. It's not, but I've been there, and I'm glad I now have a better way! 3. > > > I personally don't like using the same pre and post math test because students have already been exposed to the questions. I often pull out my math pre-assessments to have students go back and see that they now understand problems that they didn't understand at the beginning of the unit. For me to feel really good about my students' mastery of a topic, I like to see that they can solve similar (but different) problems on the post math test. This is not my favorite way to test students. This type of math pre-assessment is usually based on the current grade-level's standards. As a pre-assessment, it contains concepts and skills that students may have never been exposed to. While you may get a window into students' misconceptions, this pre-assessment approach can lead to a lot of teacher overwhelm and waste a good chunk of class time, especially if you cannot wrap your head around how to move forward with ALL of the data you have collected. A detailed math test of ALL of the standards for one unit may also take a large chunk of class time (often 1-2 math blocks). 2. Use a math pre-assessment that is similar to the post assessment but contains different questions. Students will not have been exposed to the exact post-test questions before. This testing approach doesn't get me excited either. If differentiation is one of the main purposes of my pre-assessment, I don't want to have so much data that I don't know where to start. 3. Use mini quizzes focused on targeted skills and concepts for your grade level's objectives. With short math pre-assessments or quizzes, you are less likely to feel overwhelmed by the data you have collected, and students will be able to show MORE of what they know. Most importantly, you will have specific data on what your students are able to do and not do with your grade-level's standards. > > > You will most likely be "pre-assessing" more often. You will have to plan for pre-assessments more strategically and think of your unit in chunks of related concepts. > > > Math tests based only on grade-level standards do not always give struggling students the opportunity to show growth OR gifted students the opportunity to be challenged. These grade-level-only based math tests may still just having you sorting students into the "doesn't know it yet" and "has mastered it all" groups. This testing approach is a good start. Math tests with short quizzes based on grade-level expectations makes it easier to sort students into "gets it/doesn't get it" groups. It also allows you to address very specific math concepts, rather than feeling overwhelmed that some students have mastered "everything" and others have a #wholelot of deficits that you need to remediate. 4. Use leveled pre-assessments that are based on a continuum of understanding. Leveled or "tiered" pre-assessments contain sections of questions based on below-grade level, on-grade level, and beyond-grade level standards. I call these "differentiated math assessments" and I've spent the past year developing leveled math tests for 4th grade and 5th grade math. Leveled math pre-assessments allow you to assess students on a range of skills that you consider "pre-requisite" to grade-level concepts and a "stretch beyond" grade-level expectations. Leveled math pre-asssessments allow you to get a better understanding of the depths of students' knowledge--have they mastered pre-requisite skills, and are they therefore ready to tackle grade-level concepts? Are students struggling with the "building blocks" from previous grade-levels and will therefore need remediation before they are ready to meet your grade-level standards? Do students already know how to solve problems based on your grade-level standards and therefore will be ready to "stretch beyond" your grade-level standards-focused lessons? With data from pre-assessments that contain a continuum of learning objectives, you will be ready to differentiate your lessons, stations, and student assignments right away! > > > You may be (mini) testing students more often, because you are looking at individual standards. However, you do not have to pre-assess students on every single standard in your unit in order for them to make progress. I suggest pre-assessing students on the skills and standards that are the MOST important and/or those where students are typically on a wide range of mastery (like adding and subtracting fractions, rounding, or subtraction with borrowing). This is my favorite way to assess students. I love giving students the opportunity to show mastery of pre-requisite skills before expecting them to try grade-level math problems. I also like that students who are advanced and can already complete math problems on grade-level have the opportunity to be challenged by higher-level questions and see that they too have new things to learn in our upcoming unit. I challenge you to use leveled pre-assessments in math as an opportunity to become an "assessment junkie" + "growth-mindset enthusiast" this school year. Do you need leveled pre-assessments for your 4th or 5th graders that are based on a continuum of standards and skills? I've created math tests containing three levels of mastery called building blocks, goals, and stretching beyond. 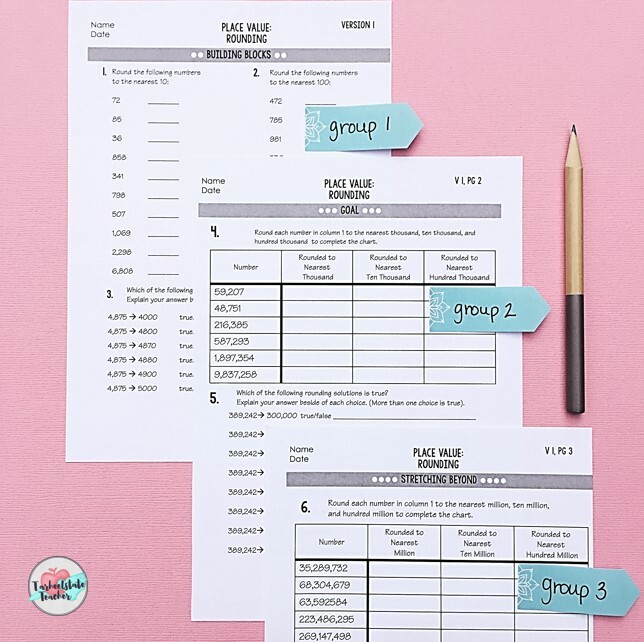 The math test sets contain 3 versions for each standard so that you can pre-assess, assign practice or small group work, quiz, and post-assess with ease. You'll be able to easily see growth by comparing students' pre- and post- data as the math tests contain identical formats and number of problems. Best of all, your STUDENTS will be able to examine their growth and realize that they are LEARNING and MASTERING math concepts. You'll be able to encourage growth mindsets within all of your math units! You can find the 4th Grade Math Tests (for pre-tests and post-tests) here in my tpt store or by clicking the photo above. You can find the 5th Grade Math Tests (for pre-tests and post-tests) here in my tpt store.